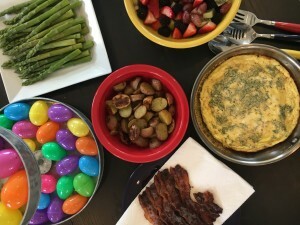 Easter is popular day for brunch. 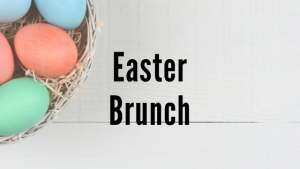 I am sharing some of my favorite brunch ideas and recipes with you today. These are easy and quick recipes so you won’t spend all of your time in the kitchen! Preheat oven to 350. In a bowl whisk 8 eggs and 2 tablespoons of milk of choice. Add in 5 ounces of smoked salmon and 1/4 cup of roughly chopped fresh dill and salt and pepper. In an oven safe skillet heat 1 tablespoon of olive oil pour in egg mixture. Make sure the salmon is evenly distributed. Once the sides start to set put in the oven checking after 12 minutes. I use 1 pound of red potatoes and leave the skin on. In a ziplock bag add 3 tablespoons of olive oil, 1/2 teaspoon each of garlic powder, dried parsley, salt and pepper. Add in potatoes, coating evenly. On a baking sheet evenly spread the potatoes. Roast in oven for 25-30 minutes stirring half way through. Bake for 15-18 minutes turning pan half way through so bacon browns evenly. Have a mimosa or Bloody Mary bar. Or both! You can make these ahead of time or have a station for everyone to make their own. Get creative with the garnishes. Frozen fruit on small skewers for the mimosas. Bacon or something pickled for the Bloody Mary. Serve the frittata with an arugula salad with a lemon vinaigrette or a light dressing or some roasted asparagus. For something sweet have a fruit salad. Make it your own and have fun doing it! I love Irish Mule’s, but i always like to incorporate healthy ingredients into everything I make. 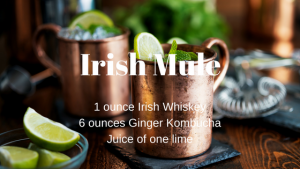 Follow this simple recipe to make your own Irish Mule with Ginger Kombucha and Irish Whiskey. For this recipe I added 1 ounce of Irish Whiskey, 6 ounces of Ginger Kombucha, and squeezed in a full lime. I added all these ingredients into a shaker with ice and mixed. If you want to ace the presentation, service in a copper metal glass, and garnish with a lime wedge. 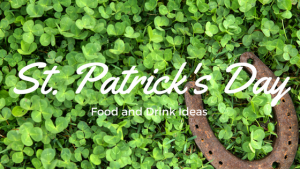 Irish or not St. Patrick’s Day is fun to celebrate! These are not traditionally Irish but they are fun and simple ways to celebrate all day! The first recipe is great for breakfast. 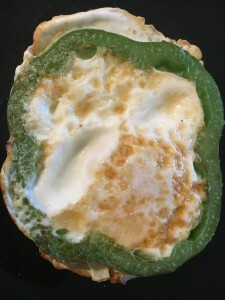 Eggs fried in a “shamrock”. Super easy and a fun way to start the day! St. Patricks Day falls on a Friday this year. Enjoy your Friday Night Pizza night with shamrock personal pizzas. The dough is super easy to make and you will know exactly whats in it. No time for making your own dough? Most grocery stores have fresh made dough available in the deli section. 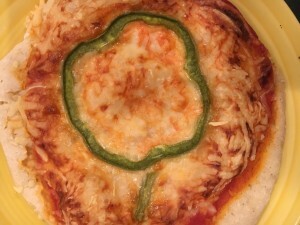 Sliced bell peppers are the shamrocks on these pizzas. You could add any green toppings you want. Anything! Have fun! Finish the night with Lime Sherbet Floats. A fun twist on a root beer float with sherbet and Sprite. 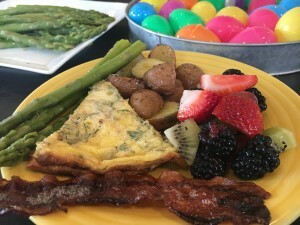 A few other healthy, fun ideas: Greens and eggs. Scramble eggs with greens like spinach. Pesto. Great on a pizza. Green smoothies. Eat the rainbow. Place veggies in the order they appear in the rainbow. 1 bell pepper remove the ends, ribs, and seeds. Slice the bell pepper into thin slices. They will look like shamrocks. Heat a pan over medium heat with coconut oil or butter whatever you prefer. Place pepper slices in pan break egg into the middle of the pepper. Cook to preference. In a bowl mix 1 Cup all purpose flour, 1 Cup Whole Wheat flour, 1 teaspoon salt. (This recipe is super easy to make gluten free by using 1:1 gluten free flour. My favorite it Bob’s Red Mill). Make a well in the dry ingredients. Add 2 tablespoons olive oil. Then add in the wet ingredients and mix. Next, on a floured surface knead for about 10 minutes. Oil a bowl place dough in cover. Let rise for 1 hour. Cut dough into four pieces. Roll out into small circles. Add sauce and cheese. Slice the bell pepper into thin slices using one for stem pieces. Bake checking after 15 minutes. The dough should be golden and cheese should be bubbly. *If you made this with gluten free flour you will need to add about a 1/4 cup more water. Come on how cute are these?! And for dessert these lime sherbet floats will be a hit! Great for the kids and adults. Who doesn’t love a float?! In a glass place 2 scoops lime sherbet, top with Sprite. Serve with a fun straw! These recipes were a lot of fun to make and were a hit in my house! Have a Happy St. Patricks Day! Life gets busy! Its nice to be able to have a list of favorite recipes that you can go to. I like simple recipes that can be adapted to what I have on hand. I really like meals that use up leftovers in a different way if its a one pot meal even better. Cooking this way makes me get creative and is how some of my favorites meals are made up. Here are a few ideas for you to use. Tacos. We have tacos a lot they make easy no think dinners. Ingredients can be adapted to whatever you have in the fridge. I have no rules when it comes to tacos. Roasted veggies, beans, meat, lettuce, or tortillas. Add cheese, salsa, or whatever else as topping. Super easy way to clean out the fridge and use up leftover veggies or proteins from the week. Chili. Beans and tomatoes are the base. Add whatever veggies or meat you have leftover. Sweet potatoes, zucchini, chicken, or beef. I call this clean the fridge out chili. I will toss anything I have left so nothing goes to waste. Eggs. If I’m really out of ideas roasted veggies, a grain like quinoa or rice, and throw an egg on top. Boom dinner! Eggs are great on top of salads too. Chicken Veggie Bake. On a baking sheet toss chicken cut into chunks with veggies. Top with any sauce or seasoning you want. Bake. Serve with a grain or alone. Protein, Veggie, and Grain. Last but probably the most used in my house. Chicken, beef, fish, or any form of protein you want. Add steamed Veggies and a grain and you have a complete meal. Bonus you can make extra and have a lunch or stuff to throw on a salad. These make up a lot of the dinners I make in our house. I like easy week night dinners with minimal clean up. They are meals made of staples I always have in my fridge or leftovers from dinners during the week I don’t want to waste. You will not miss the meat in this chili. 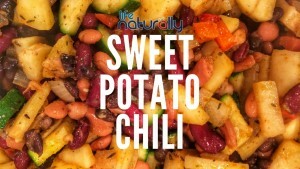 The sweet potato gives this chili some sweetness while also giving it enough substance to keep you full. A big pot of chili or soup is a great way to use up extra veggies and clean out your fridge. This recipe is a great and usually made in some version weekly in my house. 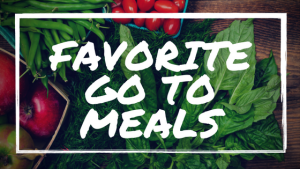 You will have leftovers for lunches or another dinner for the week. This recipe also freezes really well for future use. Heat a large pot with 2 tablespoons coconut oil. Add in onion and garlic cook until soft. Add in sweet potato cook until soft. Add in zucchini and bell pepper. Add in spices and let cook for a few minutes until fragrant. Add in drained beans cook for 3 minutes. Add in tomatoes and stock. Bring to a boil. Cover and simmer stirring occasionally until slightly thickened. Add in kale and cook until wilted. Serve. * don’t have these on hand use whatever you have or whatever your family prefers. Try beats for a great tasting food who’s health benefits have been well documented. I enjoyed this salad because it tasted great but also left me feeling full which usually doesn’t happen when I eat salads. Beets are rich in soluble fiber which slows down digestion and makes you feel full longer and reduces LDL (bad) cholesterol. They are also rich in folate a B vitamin that may help prevent birth defects and also against heart disease and cancer. Pre-heat oven to 425 degrees. Slice beets, spread on a baking sheet, and drizzle with olive oil and salt and pepper. Bake for about an hour depending on thickness. Toss the spinach or other greens with the balsamic vinegar and place on a plate. Let beets cool and remove the skin. I prefer to remove the skin after baking its easier I think. Place beets on greens top the beets with a spoonful of goat cheese. Hunting season is in full swing and if your lucky enough to fill your tag this year try out these delicious elk meatballs. The large unsettled forests, lush landscape, and mild temperatures provide the perfect environment for elk to thrive. In fact, the Pacific Northwest has some of the largest elk in the United States. Wild game is very healthy and adding zucchini not only tastes great, but keeps the recipe gluten free. You can make this recipe with either elk or deer. If you’re lucky enough to fill your tag try out this meatball recipe! This is how your elk meatballs should look before they go into the oven. Before you place your meatballs on the pan it is best to coat it with a health non-stick spray. Once the meatballs have finished cooking, let them cool for 5 minutes and your ready to eat. I hope you enjoyed the recipe and good luck! Start by with 1 LB raw elk or deer. Mix all these ingredients together into small meatballs. Put the meatballs on a cooking pan. Cook at 350 degrees for approximately 15-20 minutes. Do you like fish tacos? I know I do, but fish can be expensive. Save cash by making your fish tacos with Rockfish. Rockfish is a lean fish low in saturated fat and high in long chain omega-3s. It is high in Vitamin D, potassium, phosphorus, magnesium, and choline. It is affordable and makes delicious tacos! Here is how we made these delicious and healthy Rockfish tacos. Makes 4 tacos in 8 inch tortillas. The healthier I eat the easier it becomes to eat healthy. A few years ago my morning breakfast consisted of either cereal or eggs and some kind of breakfast meat. Times have changed, now I eat nearly 100% vegetarian and I opt for a lighter healthier breakfast. My breakfast of choice is simply a healthy breakfast smoothie with all my favorite fruit and vegetables. Once I discovered juicing and smoothies there was no going back. Now I prefer to start my day with a healthy breakfast juice or smoothie. I discovered i’m less bogged down, I have more energy, and I eat less food throughout the day. When making my morning smoothie I usually don’t adhere to a specific recipe, but instead I toss whatever fruit and veggies I have on hand into my Vitamix Blender. The secret to a good smoothie is to use some frozen fruit or to add a few ice cubes. I prefer to use a small handful or Organic frozen blueberries in my breakfast smoothie. Here is my favorite smoothie recipe, but remember, any ingredients will do as long as they are fresh and organic. Health “so called” gurus constantly repeat the mantra, “always eat a big breakfast” or “breakfast is the most important meal of the day.” Hearing this health advice since I was young had convinced me to always eat a large breakfast, sometimes even when I wasn’t that hungry. Overtime I’ve learned to listen less to what others say, but instead listen to what my body is telling me. I’m usually not hungry first thing in the morning, but I would always eat a big breakfast anyways. This routine left me feeling bloated throughout the day. I noticed that if I ate a big breakfast, I would eat big and usually unhealthy meals for the rest of the day. I found if I skipped a big breakfast and instead had a healthy morning smoothie, I felt more energized and would eat smaller portions throughout the day. The base ingredients used in my healthy breakfast smoothie were organic cucumbers, organic lemon, organic red apple, organic banana, organic frozen blueberries, and Bragg’s raw Apple Cider Vinegar. As I mentioned earlier, if you don’t have access to any frozen fruit you can just add a few ice cubes at the bottom of your blender. I also add between 1/2 cup and a full cup of water before I start blending. The amount of water you add will determine the consistency of your smoothie in the end. My final ingredient to my super-healthy morning smoothie is Sunfood’s Raw Organic Superfood Smoothie Mix. Sunfood’s delicious nutrient filled smoothie mix is organic, raw, non-gmo, vegan, gluten-free, and tastes amazing! Sunfood’s smoothie mix is basically a mixture of 15+ different superfood powders, inlcuding Acai Powder, Chia Seed Powder, Maqui Berry Powder, Goji Berry Powder, Maca Powder, Cocao Powder, Camu Camu Powder, Lucuma Powder, Pink Himalayan Salt, and many more. Once I have all my ingredients in my Vitamix Blender I blend for approximately 30 seconds. If your produce does not properly mix together add more water. The next step is to either refrigerate or enjoy your healthy breakfast smoothie. For those seeking an even healthier smoothie try adding flax seed oil, olive oil, coconut, or hemp oil. Buying packaged ramen at your local grocery store is cheap and easy. Simply boil water and in two minutes you have lunch. The problem is, it’s also loaded with salt usually containing more than half of the daily recommended amount in one package. Consuming too much sodium increases your risk of high blood pressure, heart disease, and stroke. Packaged noodles also contain tertiary-butyl hydroquinone a food preservative that is not digestible and has no nutritional value. It is used to keep the noodles fresh and give them there long shelf life. ​Instead of eating unhealthy pre-packed store bought noodles try making your own at home. It takes a little longer to make homemade ramen noodles, around 30 minutes, but there is a lot of nutritional value in using real quality ingredients. This recipe is a start add in what you like or have on hand. Flavor the soup to fit your taste. This recipe makes around 6-8 servings depending on ingredients you use. I add sriracha to add some flavor to mine. Hot peppers are favorites too. Use what you have or like. In a large pot or dutch oven heat oil add onions and garlic sauté until fragrant. Add in the carrots cook until everything is soft. Pour in the broth and the water bring to a boil. Add in the yakisoba cook until soft around 4-5 minutes. Add in the green onions and spinach cook until wilted. Add in flavoring of your choice or let everyone decide their own. That’s it, It’s as simple as that to make delicious ramen noodles at home.